In 1962, the U.S. Navy issued a requirement for a long-range high-precision air-to-surface missile. The missile, named Condor, was to use an electro-optical (i.e. television) guidance system with a data link to the launching aircraft similar to the system of the then projected AGM-62 Walleye. The designation ASM-N-11 was initially assigned, but this was changed to AGM-53A in June 1963. Industry proposals for the Condor were received in 1964, and in July 1966, Rockwell was awarded a development contract for the Condor missile system. 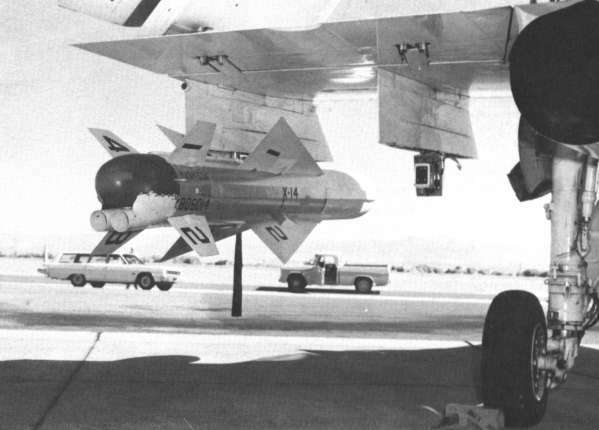 Because of numerous problems in the development phase, the first flight of an XAGM-53A missile did not occur before March 1970. One troublesome item was the missile's propulsion system. Originally, it was intended to develop a storable liquid-fuel rocket engine, but because of technical problems this had to be replaced by a less powerful solid rocket motor. The development of a reliable long-range secure data link system also proved to be more costly and time consuming than expected. The Condor was a long-range missile to be used for high-precision stand-off attacks. The missile was launched by the strike aircraft from a distance of up to 110 km (60 nm) to the general target area. Shortly after launch, the rocket motor ignited, and the two-way data link between the missile and a control pod on the aircraft was established. The position of the missile was continuously tracked, and corrective commands were sent to the Condor by the control pod. Because the tail of the missile was occupied by the data link equipment, the rocket motor exhausted through two small nozzles below the tail. When the AGM-53 approached the expected target position, the image of the TV camera in the missile's nose was transmitted back to the operator in the launching aircraft. The operator could switch between wide and narrow field-of-view images to find a suitable target. As soon as a target had been selected, the operator could either fly the missile manually until impact, or lock the Condor on the target and rely on the missile's capability to home on the final aiming point. The Condor's linear shaped-charge warhead detonated on impact. The engineering development and operational evaluation phases of the Condor program were completed in July 1975, and procurement of 250 operational AGM-53A missiles was planned for 1976. Condor was to be used mainly by the A-6E Intruder, but the A-7 Corsair and even the F-14 Tomcat were at also considered as launch platforms. This was not to be, however, because the AGM-53 program was cancelled in March 1976. Its long range and potentially high precision made the Condor a very powerful weapon, but it was much more expensive than contemporary tactical air-to-ground weapons. The secure data link contributed a signficant portion to total missile cost, and it certainly didn't help that this link was still somewhat unreliable. Additionally, the relatively small warhead made the missile possibly ineffective against those larger targets, which would have warranted the use of such a costly weapon. During development of the Condor, some alternative configurations were proposed. One of these was the AGM-53B, which was to use a different data link with improved EMI (Electromagnetic Interference, i.e. countermeasures) resistance. Other proposed options for Condor included a turbojet propulsion for increased range (185 km (100 nm)), and a W-73 nuclear warhead. However, none of these proposals were further developed.